The primary oxygen generator for the International Space Station (ISS) is drawing more power than normal to continue working, NASA officials said today. ISS flight controllers instructed the station's current crew, Expedition 10's Leroy Chiao and Salizhan Sharipov, to ramp up power to the Russian-built Elektron oxygen generator to keep the recently repaired device functioning. "At this hour, the Elektron is up and running at a higher amperage," NASA spokesman Rob Navias said today during NASA TV's daily ISS commentary. Instead of drawing its normal 32 amperes of electric current, the device now relies on a 50-ampere supply fed by a second power channel from the station's U.S. electrical system. The Elektron glitch is more a nuisance than a danger to the ISS crew since Chiao and Sharipov have more than a 150 days worth of oxygen readily available from other sources aboard the orbital outpost. Should the Elektron generator fail completely, the Expedition 10 crew would still have ample air and oxygen to last through the arrival of a new Progress cargo ship later this year, Navias said. But the time spent this week repairing the oxygen generator has taken time that the Expedition 10 crew would have spent on science experiments and other duties. To catch up, they spent some of today on biomedical experiments and other activities. 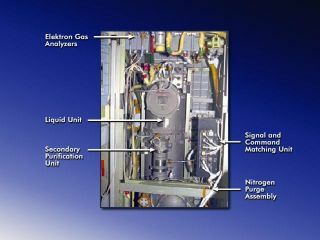 Tucked in the space station's Zvezda service module, the Russian-built Elektron device is typically used as the primary oxygen source for ISS crews. The device uses the process of electrolysis to separate water into its component parts of oxygen and hydrogen, the latter of which is dumped overboard. The recent Elektron failure occurred on Jan. 1, 2005, when its primary and backup pumps shut down. After five days of fruitless troubleshooting to clear gas bubbles from the system, Sharipov and ground engineers were able to reactivate the device on Jan. 6 by swapping the fluid from the Elektron's liquid unit with that from a spare, NASA officials said. That fix didn't last, however, and the unit's primary and backup pumps failed throughout the day, they added. The Elektron has given ISS flight controllers and previous station crews headaches as well. It failed just over one year ago during Expedition 8, then again during Expedition 9, when commander Gennady Padalka and Michael Fincke were able to keep the device working intermittently until the Expedition 10 crew arrived with spare parts to make more repairs.